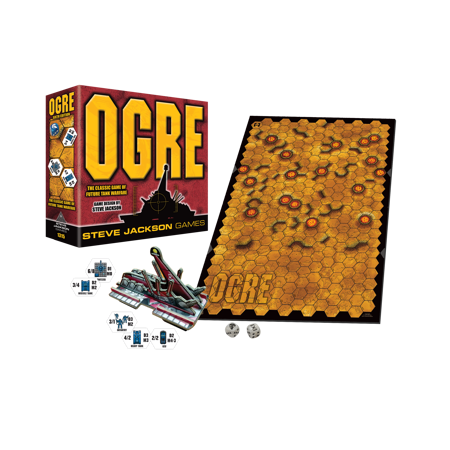 Daily Illuminator: Play Ogre Sixth Edition At BGG.Con! November 17, 2016: Play Ogre Sixth Edition At BGG.Con! We're on the road this week, but not too far from home. The SJ Games crew has set up shop at BGG.Con in Dallas, TX, November 16-20. Among the other amazing new and upcoming releases we're showing (like early copies of Batman: The Animated Series Dice Game, Super Munchkin Guest Artist Edition, and Munchkin Apocalypse: Judge Dredd, to name a few), we'll have Ogre Sixth Edition, front and center. Coming this winter, Ogre Sixth Edition gives the classic game a makeover, with Ogre Designer's Edition style components. New variant colors for the Ogres, Command Posts, and units, as well as pearl-white Ogre dice, make Ogre Sixth Edition unique aesthetically, but not required for someone who owns Designer's Edition. It is, however, a great entry point for someone who has never played Ogre, or wants a fast, futuristic wargame with awesome components. Find out more about the similarities and differences between the two games straight from our Ogre Line Editor, Drew Metzger. For a look inside the box, check out our Ogre Sixth Edition unboxing over on YouTube. So come by our booth for a demo of the metal-mashing combat of the future! And if you are already a die-hard Ogre fan, check out our Ogre Miniatures Set 1 Kickstarter, running until November 30. If you think the cardboard miniatures are awesome, wait until you see them in plastic! It's an upgrade worthy of the year 2085 A.D.